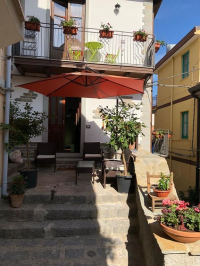 The B&B Olivella lies among the picturesque streets of the San Michele district, in the highest part of Sciacca, including some important churches and the best preserved parts of the ancient walls. Each room is equipped with all comforts: private bathroom, air conditioning, hairdryer, Tv, minibar, wi-fi. You only share a terrace with a panoramic view, a library and a bike workshop.